eBird is an online tool for recording bird observations. The eBird database currently contains over 500 million records of bird sightings, spanning every country and nearly every bird species, making it an extremely valuable resource for bird research and conservation. These data can be used to map the distribution and abundance of species, and assess how species’ ranges are changing over time. This dataset is available for download as a text file; however, this file is huge (over 180 GB!) and, therefore, poses some unique challenges. In particular, it isn’t possible to import and manipulate the full dataset in R. Working with these data typically requires filtering them to a smaller subset of desired observations before reading into R. This filtering is most efficiently done using AWK, a Unix utility and programming language for processing column formatted text data. 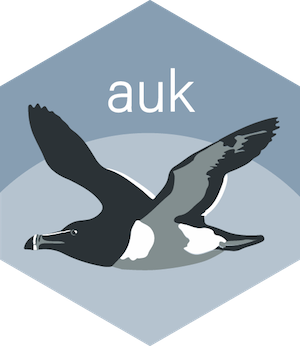 The auk package acts as a front end for AWK, allowing users to filter eBird data before import into R, and provides tools to perform some important pre-processing of the data. Them name of this package comes from the happy coincidence that the command line tool AWK, upon which the package is based, is pronounced the same as auk, the family of sea birds also known as Alcids. 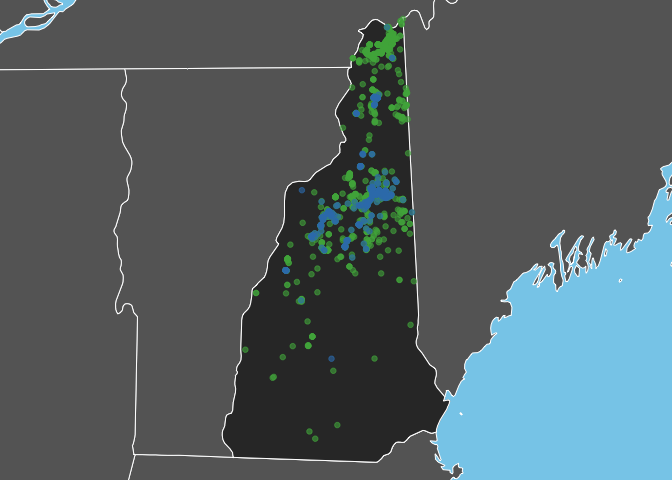 This post will demonstrate how to use auk to extract eBird data for two bird species (Swainson’s and Bicknell’s Thrush) in New Hampshire, then use these data to produce some maps comparing the distributions of these species. auk requires the Unix utility AWK, which is available on most Linux and Mac OS X machines. Windows users will first need to install Cygwin before using this package. Note that Cygwin should be installed in the default location (C:/cygwin/bin/gawk.exe or C:/cygwin64/bin/gawk.exe) in order for auk to work. Access to the full eBird dataset is provided via two large, tab-separated text files. The eBird Basic Dataset (EBD) contains the bird observation information and consists of one line for each observation of a species on a checklist. The Sampling Event Data contains just the checklist-level information (e.g. time and date, location, and search effort information) and consists of one line for each checklist. To obtain the eBird data, begin by creating an eBird account and signing in. eBird data are freely available; however, you will need to request access in order to obtain the EBD. Filling out the data request form allows eBird to keep track of the number of people using the data and obtain information on the applications for which the data are used. Once you have access to the data, proceed to the download page. Download and uncompress (twice!) both the EBD and the corresponding Sampling Event Data. Put these two large text files somewhere sensible on either your computer’s hard drive or an external drive, and remember the location of containing folder. Let’s start by loading the required packages and defining a variable for the path to the folder that contains both the EBD sand sampling event data. Some rows in the EBD may have special characters in the comments fields (for example, tabs) that will cause import errors, and the dataset has an extra blank column at the end. The function auk_clean() drops these problematic records and removes the blank column. In addition, you can use remove_text = TRUE to remove free text entry columns, including the comments and location and observation names. These fields are typically not required and removing them can significantly decrease file size. The EBD is huge! If we’re going to work with it, we need to extract a manageable subset of the data. With this in mind, the main purpose of auk is to provide a variety of functions to define taxonomic, spatial, temporal, or effort-based filters. To get started, we’ll use auk_ebd() to set up a reference to the EBD. We’ll also provide a reference to the sampling event data. This step is optional, but it will allow us to apply exactly the same set of filters (except for taxonomic filters) to the sampling event data and the EBD. We’ll see why this is valuable later. As an example, let’s extract records from New Hampshire for Bicknell’s Thrush and Swainson’s Thrush from complete checklists in June of any year. Bicknell’s Thrush breeds at high elevations in New England, such as the White Mountains of New Hampshire, one of my favourite places in the Northeast. Swainson’s Thrush is a related, and much more widespread species, that breeds at lower elevations in the same area. While hiking in the White Mountains in the early summer, I love listening for the turnover from Swainson’s to Bicknell’s Thrush as I move up in elevation. Let’s see if this pattern is reflected in the data. Note that each filtering criterion corresponds to a different function, all functions begin with auk_ for easy auto-completion, and the functions can be chained together to define multiple filters. Also, printing the auk_ebd object will show which filters have been defined. This is just a small set of the potential filters, for a full list of filters consult the documentation. The above code only defines the filters, no data has actually been extracted yet. To compile the filters into an AWK script and run it, use auk_filter(). Since I provided an EBD and sampling event file to auk_ebd(), both will be filtered and I will need to provide two output filenames. Running auk_filter() takes a long time, typically a few hours, so you’ll need to be patient. To download the pre-filtered data used in the remainder of this post, visit the GitHub repository. Now that we have an EBD extract of a reasonable size, we can read it into an R data frame. The files output from auk_filter() are just tab-separated text files, so we could read them using any of our usual R tools, e.g. read.delim(). However, auk contains functions specifically designed for reading in EBD data. These functions choose sensible variable names, set the data types of columns correctly, and perform two important post-processing steps: taxonomic roll-up and de-duplicating group checklists. By default, two important pre-processing steps are performed to handle taxonomy and group checklists. In most cases, you’ll want this to be done; however, these can be turned off to get the raw data. ISSF or Identifiable Sub-specific Group: Identifiable subspecies or group of subspecies, e.g., Mallard (Mexican). Rolled-up to species level. Intergrade: Hybrid between two ISSF (subspecies or subspecies groups), e.g., Mallard (Mexican intergrade. Rolled-up to species level. Form: Miscellaneous other taxa, including recently-described species yet to be accepted or distinctive forms that are not universally accepted (Red-tailed Hawk (Northern), Upland Goose (Bar-breasted)). If the checklist contains multiple taxa corresponding to the same species, the lower level taxa are rolled up, otherwise these records are left as is. Spuh: Genus or identification at broad level – e.g., duck sp., dabbling duck sp.. Dropped by auk_rollup(). Slash: Identification to Species-pair e.g., American Black Duck/Mallard). Dropped by auk_rollup(). Hybrid: Hybrid between two species, e.g., American Black Duck x Mallard (hybrid). Dropped by auk_rollup(). Domestic: Distinctly-plumaged domesticated varieties that may be free-flying (these do not count on personal lists) e.g., Mallard (Domestic type). Dropped by auk_rollup(). auk contains the full eBird taxonomy as a data frame. We can use one of the example datasets in the package to explore what auk_rollup() does. #>  "domestic"   "form"       "hybrid"     "intergrade" "slash"
eBird observers birding together can share checklists resulting in group checklists. In the simplest case, all observers will have seen the same set of species; however, observers can also add or remove species from their checklist. In the EBD, group checklists result in duplicate records, one for each observer. auk_unique() (called by default by read_ebd()) de-duplicates the EBD, resulting in one record for each species on each group checklist. So far we’ve been working with presence-only data; however, many applications of the eBird data require presence-absence information. Although observers only explicitly record presence, they have the option of designating their checklists as “complete”, meaning they are reporting all the species they saw or heard. With complete checklists, any species not reported can be taken to have an implicit count of zero. Therefore, by focusing on complete checklists, we can use the sampling event data to “zero-fill” the EBD producing presence-absence data. This is why it’s important to filter both the EBD and the sampling event data at the same time; we need to ensure that the EBD observations are drawn from the population of checklists defined by the sampling event data. Given an EBD file or data frame, and corresponding sampling event data, the function auk_zerofill() produces zero-filled, presence-absence data. #> Zero-filled EBD: 12,938 unique checklists, for 2 species. The resulting auk_zerofill object is a list of two data frames: observations stores the species’ counts for each checklist and sampling_events stores the checklists. The checklist_id field can be used to combine the files together manually, or you can use the collapse_zerofill() function. This zero-filled dataset is now suitable for applications such as species distribution modeling. Now that we’ve imported some eBird data into R, it’s time for the fun stuff! Whether we’re making maps or fitting models, most of the application of eBird data will occur outside of auk; however, I’ll include a couple simple examples here just to give you a sense for what’s possible. One of the most obvious things to do with the species occurrence data is to make a map! Here I’ll compare the distributions of the two thrush species. Bicknell’s Thrush is a high elevation breeder and, as expected, observations of this species are restricted to the White Mountains in the North-central part of the state. In constrast, Swainson’s Thrush occurs more widely throughout the state. The above map doesn’t account for effort. For example, is a higher density of observations indicative of a biological pattern or of more birders visiting an area? We can address this by using the zero-filled data to produce maps of frequency of observation on checklists. To do this, I’ll start by converting the eBird data into a spatial object in sf format and projecting to an equal area coordinate reference system. Next, I’ll create a raster template from this spatial object consisting of a regular 10km grid of cells. Then I use rasterize() to calculate the observation frequency within each cell. Finally, let’s visualize these data to compare the spatial patterns between species. Swainson’s Thrush are more widepsread and more frequently seen, while Bicknell’s Thrush is constrained to the White Mountains, and both species are uncommon in southern New Hampshire. Those interested in eBird data may also want to consider rebird, an R package that provides an interface to the eBird APIs. The functions in rebird are mostly limited to accessing recent ( i.e. within the last 30 days) observations, although ebirdfreq() does provide historical frequency of observation data. In contrast, auk gives access to the full set of ~ 500 million eBird observations. For most ecological applications, users will require auk; however, for some use cases, e.g. building tools for birders, rebird provides a quick and easy way to access data. rebird is part of the species occurrence data (spocc) suite. Users working with species occurrence data may be interested in scrubr, for cleaning biological occurrence records, and the rOpenSci taxonomy suite.